Marine Corps general officers' "distinguishing flags" are 36 by 52 inches rather than 36 by 48 like the Army and Air Force. Marine Corps Post Commander, circa World War I - The commander of a marine corps post below general officer rank was authorized to display a pennant in the bow of a boat in which he was embarked. This pennant was 1:3, the hoist (one-third the length of the fly) blue with thirteen white stars in rows of 4, 5, and 4, the remainder scarlet with the Marine Corps badge of eagle, globe, and anchor in white on the scarlet area. Also shown in [gmc17]. U.S. Marine Corps guidon of A Company, 2nd Marine Regiment. Those letters are FMF for units of the Fleet Marine Force. U.S. Marine Corps companies and equivalent units carry rectangular scarlet guidons with a silhouette of the Corps' eagle-globe-anchor emblem in yellow in the center. In an arc above the emblem are the letters "FMF" in the case of units of the Fleet Marine Force, "USMC" for other active units, and "USMCR" for reserve units. In the lower hoist is the abbreviated designation of the parent organization. For companies of infantry battalions or batteries of artillery battalions, the lower hoist contains the battalion number followed by a slash (/) and the regimental number. The company or battery designation is shown in the lower fly. Dimensions are 22 x 28 inches. The guidon staff is eight feet long, including the ferrule and the silver-colored spearhead finial. 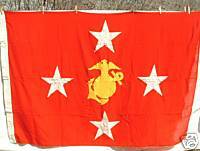 US Marine Corps, Dress Guidon Flag, 1959 located on eBay. (1) The ceremonial flag carried by troops is now designated the "battle standard" rather than "battle color" for operational units, and "organizational standard" rather than "organizational color" for other units. (2) Previously announced changes removing the abbreviations FMF (fleet marine forces) and USMCR (United States Marine Corps Reserve) from the scroll on the color/standard have now been promulgated in a permanent directive. (3) The guidon carried by companies, artillery batteries, and aircraft squadrons is now specified to have the letters USMC in an arc above the corps badge. In the past, FMF units had FMF above the badge, other units either USMC or USMCR as appropriate. In 2003, the FMF and USMCR abbreviations were dropped, and whether to have USMC or simply a blank space was left up to various command headquarters. The design is now standardized as attached. The guidon is 22 x 28 inches (approx. 56 x 71 cm). Not a change, but not previously reported, there is also a "dress guidon" issued to each company, battery, etc., 18 x 19 inches (46 x 48 cm), scarlet with the letters USMC in golden yellow, surrounded by golden yellow fringe. The dress guidon is used (typically planted in the ground or mounted on a stand) during ceremonies to mark the line of troops, turning points, the saluting base while passing in review, and the like. 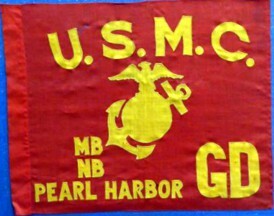 This would appear to be the guidon of the Guard Detail at the Marine Barracks/Naval Base Pearl Harbor. The US Marine Corps has made some minor changes to its organizational flags. The changes, announced by message on 6 June (CMC 061430Z JUN 03 MARADMIN 267/03) (1) delete the abbreviation "FMF" (for Fleet Marine Force) from unit colors/standards and guidons, and (2) eliminate the separate sets of organizational flags and guidons with the inscription "USMCR" for units of the Marine Corps Reserve. FMF is being dropped because the term for these units has been changed from Fleet Marine Force to Operating Force; future unit colors will simply have the unit designation without letters following it. Guidons for operating force units will either have no letters above the USMC emblem or the letters USMC, at the discretion of higher headquarters. Existing colors/standards and guidons will continue to be used until they are unserviceable. Also, I discovered the answer to an issue that we went through quite some time back regarding the color of the emblem on the center of the Commandant of the Marine Corps (CMC) flag. At a website of the Defense Logistics Agency, http://ct.dscp.dla.mil, it is possible for military organizations to order a wide variety of flags. It's basically an on-line military flag catalogue. Each different variation (size, fabric, etc.) of each flag has its own stock number--all of these for flags and related items begin with the numerals 8345. Most of the listings come with small photographs. What I found was that the indoor/parade flag of the CMC--52 x 66 inches with embroidered emblem and yellow fringe--is as I reported it based on an official drawing and shown above. However, the bunting CMC flags used for hoisting on fixed poles, without fringe, have a solid yellow appliqued emblem with no detailing as on the parade/indoor flag. This explains the inconsistencies in various sources on the design of this flag that have been found in the past.